It’s not only mother or your colleague who’s asking from time to time. Policymakers are interested, too. The Organisation for Economic Cooperation and Development (OECD) every year comes with thick studies to answer the question. Earlier this month, the 2017 edition was published, mapping how people in OECD countries feel about a bunch of things: jobs, health, safety, life satisfaction, and so on. Altogether, the datasets cover eleven broad indicators of the OECD Better Life Index. These studies are important. Data is power, and having information on how people feel matters a great deal to making the world a better place. As the OECD says it: it helps achieving well-being for all. Incomes and earnings went up, by 8% and 7% respectively. But inequality remains strong: 1/3 of people would go in poverty if they had to miss three months of salary. The employment rate went up by 1.3 percentage points, and working hours improved in most countries. But long-term unemployment got worse in half of the countries. Since 2005, the number of smokers reduced from 22% to 18%. But the number of obese people increased from 22% to 24%. Education levels see strong improvements. But voter turnout and trust in government decline in more than half the countries. A large part of the 2017 report is dedicated to equality. While debates about inequality are often about wealth and income, the OECD believes that inequality is felt in every area of our lives. And as a special section of the report shows, migrants particularly tend to be worse off. This all matters, because more equal societies tend to be happier ones. While the situation is a bit scattered, there is some correlation between income equality and life satisfaction. In OECD data, the correlation is even stronger when inequality is plotted against the broad well-being indicators. Take the examples of the United States and Denmark. If you are successful in life, you can have all the American dream. The US is a ‘winners’ society: it is an extremely rewarding environment to build a business and prove yourself. Income taxes are low, and healthcare and social security provisions are bare. At the level of society, the payoff in happiness is not too high. America ranks 14th in the World Happiness Report, with an average below 7 out of 10. Not that great, one might say. 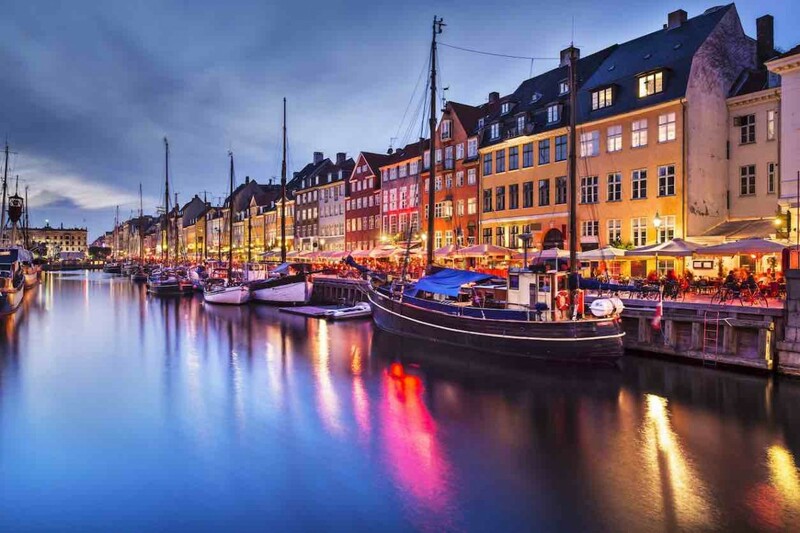 Denmark, to the contrary, is a society that also wants to make ‘losers’ thrive. It offers a strong social security system, that’s even a factor contributing to high happiness. Denmark also wants to offer a good life to people that ‘fail’ in life. Indicative for the Danish way of looking at success is the ‘Janteloven’, or Law of Jante. Janteloven is a list of ten rules that basically boil down to: don’t imagine you’re someone, we’re all the same, and you’re not worth anything. Though, depressingly, the sense of equality it instills helps contributing to a balanced, and happy, society. Denmark often ranks on top of the happiness list, finding itself back at 2 in 2017. Either way, Americans and Denmark are both as they are. Even cultural differences in our thinking about inequality could affect our happiness. Beyond books and articles about hygge, reports like the OECD one help to learn from each other. It feels naive to write this down, but the United States can become a little bit more like Denmark. 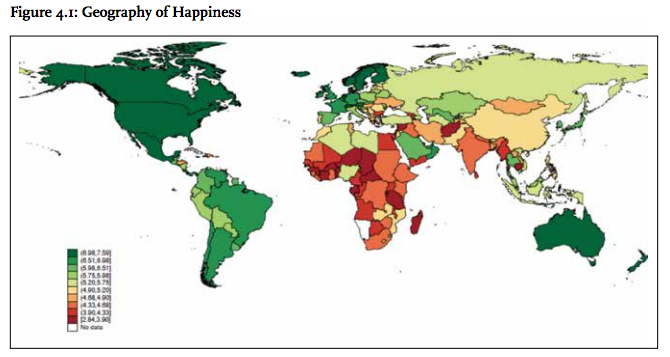 And among the wealth of data, Denmark can also find some inspiration in how people in the US pursue happiness. One of the comments Twitter had a lot yesterday: ‘who decided that the International Day of Happiness would be on Monday’? While Monday isn’t the least happy day of the week (it’s Wednesday), it may be a surprise that the first day of the new working week is the International Day of Happiness. But that was just the case this year: the day simply falls on 20 March, every year, forever. It seems that interest in the day has picked up compared to when I wrote about it in 2014 and 2015. Via Twitter, I was flooded with articles and infographics about ways to be happy and happiness at work. That’s a great development, I’d say! The publication of the World Happiness Report has become another regular fixture on the calendar of happiness enthusiasts (see my take in 2015 here). This year, its release coincided with the International Day of Happiness. Norway narrowly overtook Denmark (1st in 2016 and also in 2014) as the happiest country in the data from 2014-2016. A very important disclaimer: the differences between these two and Iceland (3rd) Switzerland (4th, ranked 1st in 2015) are statistically insignificant. In brief, we don’t really know if Norwegians are really happier than the Swiss. It remains mind-blowing how important equal societies, high trust (measured via perceptions of corruptions), and small populations are. Like last year, the rest of the top-10 is completed by Finland, Netherlands, Canada, New Zealand, Australia and Sweden. The section on the United States recognises its decline. This is not a failure in attempts to Make America Great Again – though polarisation is probably part of the problem. Declining social support and a reduced trust are the factors associated with this. Jeffrey Sachs observes that the US ranked 3rd in the OECD in 2007, compared to 19th in 2016. Given the fact that GDP is still growing but happiness is in decline, it is imperative that the US works on its social crisis. Also in China, the data show surprising results. China’s GDP per capita has seen a five-fold increase in 25 years. If money were to buy happiness, the levels of happiness and well-being should increase, especially for the millions of people who escaped poverty and came to form China’s new middle class. Instead, multiple studies reveal that happiness fell a bit in the 2000-2005 period, before increasing again in 2010-2014. In the earlier period, unemployment and a weaker social safety net reduced happiness, and the recovery of happiness levels took a long time. China now ranks 79th, below South Korea and the Philippines, but ahead of Indonesia and Vietnam. It also outranks Greece, where happiness suffered during the long-standing economic crisis, and the cradle of Gross National Happiness (GNH), Bhutan. With the exception of pockets of red (unhappy) and orange (less happy) in Africa and part of the Middle East and Asia, overall, the world looks quite green and happy. There is a lot green to see on this map, from North America to Latin America, in Europe, in most of Asia, and in Oceania. Overall, the world is quite a happy place – and mind you, it’s the only planet where the International Day of Happiness is celebrated! This is how the United States Declaration of Independence, proclaimed on 4 July 1776 starts. It’s great line. But how does one pursue happiness? What can one do to be happier? The US declaration of independence doesn’t answer that question, so I have resolved to do so myself. And while there are many, many, ways to pursue happiness, I think they ultimately boil down to three strategies. The first strategy to be happier is dedication. If you want, you can dedicate your life to pursuing happiness. The best example is the book under the name ‘The Happiness Project’, by author Gretchen Rubin. It’s quite a thing: one day she decided that she wasn’t happy, and that she wanted to be happier. So, she made a plan. Her plan was to dedicate one year of life to being happier. In doing so, she identified twelve topics to work on, for instance Marriage, Work, Family Relations, Reading, Spirituality, and so on. Every month she undertook different projects. In January, she worked on her energy, and started by… cleaning and keeping the house in order. In June, she worked on friendship, and made sure to remember her friends’ birthdays. In July, she worked on money, firstly reducing her dependence on happiness, but also going on a major spending spree. I’ve been told it can be great to buy a new dress. The dedication strategy is great if you’re a programmatic person. But if you’re not, or if you don’t believe you can plan and organise your way to happiness, you may prefer the awareness strategy. A simpler strategy in the pursuit of happiness is awareness. This strategy I based on the simple assumption that all of us have happy moments. But sometimes we’re just simply too busy to realise our moments of happiness. Life is great, but sometimes we need to slow down to be aware of that. That’s what the awareness strategy to the pursuit of happiness is based on: registering moments of happiness we all experience. That can be done by journaling, or by a tool called ‘Three Good Things’. The Greater Good Science Center at Berkeley and the grass roots organisation Action for Happiness both promote ‘Three Good Things’ as, in the term positive psychology puts it, an ‘intervention’. The idea is that if you write down three things during the day that made you happy. It’s the best to do it every day ebfore you go sleep. Maybe you sat down for a coffee with a friend. You enjoyed a walk in the sun. And you favourite football team won. It can be very banal. But that’s happiness. Either way, it will help you to remember and be aware. And it will also focus your spirit the next day. You’ll register moments during the day and think: this will go in my three good things today! Again, the awareness strategy requires you to put aside some time every day. The third strategy is less time bound. I call it Curiosity. This strategy is based on the idea that we are curious people. Even when we don’t dedicate ourselves to happiness all day, or ensure we’re aware every day, we can develop happiness by being curious. The idea that by learning about happiness, you can also absorb some of these lessons, and be happier, is one of the ideas behind my blog For A State of Happiness. There are plenty of places where you can learn about happiness. Or, there are dozens of TED talks about all aspects of happiness. On how to spend money on gratitude, on irrationality, or compassion. You name and you can find a talk! Another place to be curious is to read blogs. Of course you can try For A State of Happiness! But there are many. Gretchen Rubin, from the Happiness Project under the Dedication strategy, has a blog. There is a blog of the Minimalists, blogging how a life with less stuff makes them happier. And Action for Happiness shares all kind of happiness facts and tools on their site. Which strategy works for you? The US Founding Father’s put it nicely when they stated that the Pursuit of Happiness is our unalienable right. But happiness is so personal. We all pursue happiness in our very own ways. Whether your pursuit resembles the Dedication, Awareness or Curiosity strategy is irrelevant. In either case, I’ll wish you luck on the way to a state of happiness. In the United States, the self-proclaimed greatest country on earth, people are in for a surprise when you ask them to guess how high the US ranks in the World Happiness Report 2015. The US takes the fifteenth spot with a 7.119, falling just below – God-forbid … Mexico! The top-three countries Switzerland, Iceland and Denmark trail the US by about 0.4 points. Like any country in the world, the US is full of contradictions. On the one hand, it is the second largest economy, the leader of the Western world (except France), and home to the revolutionary digital industries of Silicon Valley. On the other hand, news about the US often talks about growing inequality, racial tensions, hardly affordable healthcare and education, a rising use of anti-depressants, and an inexplicable rigidity in gun policies. By some Europeans, it seen as a developed country trapped inside a developing one. So was the US a better place three decades ago? Some people think it was. Proponents of alternative economic indicators to Gross Domestic Product (GDP) have argued that since the start of neo-liberal Reaganomics, the focus has been too much on economic growth and too little on quality of life as a whole. For instance, the US Genuine Progress Indicator aims to measure exactly that: genuine progress, based on performance on economic, environmental and social issues. Comparing US scores from the 1950s until recent, it sees a peak in the 1970s. Since, the benefits of economic growth have been off-set by the cost of income inequality, leisure time, and environmental degradation. Other studies, however, draw other conclusions. It’s often written that happiness levels are remarkably stable in Western developed countries in the last 50 years. The World Values Survey does not show major movements since the 1980s. The World Happiness Report scores the US in 2015 (data from 2012-2014) only marginally lower, about -0.2, than in 2005-2007. In 1979, CEOs earned 35 times as much as the average production worker. In 2009, 185 times (after a peak of almost 300 in 2000!). In real terms, only college graduates have seen their wages grow since 1979. This is not the case for people who attended but didn’t graduate college, or only have a high school degree. This ‘education wage premium’, however, comes at the cost of student loans up to $50,000 or $100,000, begging the question what is college worth? From 1983 to 2007, the share of wealth of the upper 10% has increased from 68.2 to 73.1%, while the bottom 50% went from 6.1 to 4.2%. The World Happiness Report also points out that increasing female labour market participation could be a factor in changes in happiness: since the mid-1970s, the share of female labour has increased. At the same time, the ‘happiness advantage’ of women over men has reversed, likely because many women tend to have lesser quality jobs in the US market. At least according to the stereotypes, Americans more than any other nations are able to set an objective and go for it. That’s what the American dream is about. Professor Jeffrey Sachs, one of the contributors to the World Happiness Report, points out a couple of the answers. Increasing equality and social trust is where the answer starts. That also means a mental shift: a state providing healthcare or financing education shouldn’t be seen as giving ‘hand-outs’ or ‘redistribution’, but as a state that ensures that everybody can get ahead. In short, it’s about throwing some of solutions from Switzerland, Iceland or Denmark into the United States. If the US wants to be the best and greatest in happiness, drastically reducing social immobility and inequality is the first step to go. If there is one icon that inspires me in my discoveries on For A State Of Happiness, it is Robert. F. Kennedy. In a way, this is a bit ridiculous. For a large part, my image of the man is based on an extract of barely 300 words in a speech delivered almost five decades ago. There must be leaders alive in our times who have something to say about the topic. Robert F. Kennedy (or RFK) was the seventh out of nine children in the Kennedy family. He served as Attorney General is his brother John’s administration. After the murder of JFK, RFK was one of the most prominent members of the Democrats. In 1968, he ran for President. JFK and RFK kept a joint diary with quotes that inspired them. Many of those are aphorisms from old Greek philosophers, like Plato. French writer Albert Camus was another favourite. I really like the idea and have started my own notebook. I imagine I can look back at the quotes in some years and be re-inspired by them. “And this is one of the great tasks of leadership for us, as individuals and citizens this year. But even if we act to erase material poverty, there is another greater task, it is to confront the poverty of satisfaction – purpose and dignity – that afflicts us all. Too much and for too long, we seemed to have surrendered personal excellence and community values in the mere accumulation of material things. Our Gross National Product, now, is over $800 billion dollars a year, but that Gross National Product – if we judge the United States of America by that – that Gross National Product counts air pollution and cigarette advertising, and ambulances to clear our highways of carnage. It counts special locks for our doors and the jails for the people who break them. It counts the destruction of the redwood and the loss of our natural wonder in chaotic sprawl. It counts napalm and counts nuclear warheads and armored cars for the police to fight the riots in our cities. It counts Whitman’s rifle and Speck’s knife, and the television programs which glorify violence in order to sell toys to our children. That was on 18 March 1968. What has happened next? 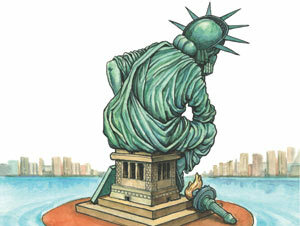 The US went through a volatile time. Martin Luther King was murdered on 4 April. RFK had the same fate on 5 June. And the elections that year were won by the Republican Richard Nixon. This month, it is 46 years ago that RFK died. Who knows what could have brought into motion if RFK had won the Presidency…?